Apps on TV? Ho hum. Twitter was a buzz with Google TV yesterday, and of course, people were making comparisons to Apple TV, talking about apps the whole time. I watched the video on YouTube, and frankly, I didn’t see anything revolutionary. I saw a bunch of features that may cater to the tech crowd, but will largely go unused for the masses. This doesn’t mean that Apple TV is any better, but frankly, I do think Apple is doing the right thing in not loading down their device with a bunch of fluff that people won’t use. There’s one thing I do with my TV, and that’s watch video. I don’t need to surf the web. I don’t need a 1080p Twitter interface. I don’t need to play FarmVille (I don’t do that on other devices, either). Perhaps they’re coming, but in the promo video, I saw very little video. The NBA Game Time thing I saw filled the screen with stats but had no video! Isn’t watching the game more important? The only thing that came close was the CNBC app, which allowed access to video on demand, versus the CNBC schedule on your cable or satellite. What I want, and it’s something that can’t be done because of the content providers, is to have digital access to all of my video, on my TV and my mobile devices. This includes the subscription package from my satellite provider, the HD video I shoot with my camcorder, and the DVDs and Blu-Ray discs I buy at the store. I need an iTunes library for video. Here are the problems today. I can’t take a show that I’ve recorded on my DVR and watch it while on the treadmill at the gym or on the plane while traveling. Yes, there’s slingbox, but I don’t want to be dealing with the poor Wi-Fi connections in a hotel room, and it certainly doesn’t work if Wi-Fi isn’t available. DVDs and Blu-Ray aren’t as problematic as there are means for ripping DVDs, and many Blu-Ray discs come in packages with a digital edition. For road trips, I know I will be soon at the point where each kid has a device in front of them where they can pick their own movie to watch without any cables, piles of DVDs, and arguments because two kids want one movie and the other one doesn’t. Apps are simply a gimmick to try to get any of these devices to make some headway. The only apps that will work for TV are games, because we’re already doing that with the Wii, the XBox, and the PlayStation. If Google or Apple wants to go after the gaming market, then an app store for a TV set top box may make sense. Otherwise, until the content providers make their video available in Internet-based channels, I just don’t see it happening. I’ll get my $99 dollar Apple TV, simply because it’s now the right price for doing the one thing that I need it to do, which is give me access to my home video library on a big screen. Apple’s shown that you can make money by doing a few things extremely well, rather than trying to sell based on the number of bullets in your feature list. Is Facebook The Consumer Cloud? With the announcement of docs.com on Wednesday from Microsoft, it got me thinking about what I’ll call the consumer cloud. As my iPhone has become a critical device for me, and I expect my iPad 3G to do the same when it arrives on 4/30, I find myself longing for better use of the cloud for my information. The simplest example is the iTunes tether. I listen to quite a few podcasts, and I have a script set up every night on my MacBook Pro to download the latest podcasts and then sync my iPhone, so they’re ready for my drive in to work in the morning. It’s a big problem when I travel, though, because the iPhone only knows about the podcasts that have episodes, and for feeds that don’t exist in iTunes, like my personal playlist for IT Conversations, I have no way of downloading new episodes without the tether to my MacBook. With my iPad on the way, I expect that the need for a cloud repository will grow even more. Some tools provide their own cloud-based storage, like Evernote. There are cloud repositories or syncing utilities like DropBox, MobileMe, and Box.Net, but so far, the integration with the content editing or viewing tools isn’t there, in my opinion. That’s especially surprising with MobileMe, at least for the iPhone. These needs are what makes Microsoft’s announcement so interesting. Ironically, even Apple showed a hint of recognizing the power of Facebook in the recent “dog” iPhone ad. When they discussed sharing pictures in the commercial, they weren’t shared via MobileMe, they were shared via Facebook. If Facebook becomes the de facto place for sharing, does that make it the de facto cloud storage solution for the consumer segment? It arguably is already doing that for photos. My brief visit to docs.com emphasized Facebook’s role in access control more so than actually storing the documents, but at that point, Facebook is still the gatekeeper. With the enormous community that Facebook has, it will be interesting to see what happens to things like MobileMe. What is clear is that Facebook is in the driver’s seat, and everyone else is either chasing them or hopping aboard the Facebook bus. I just posted a response to a question about the iPad in an enterprise setting over in an eBizQ forum and decided that I wanted to expand on it here in a blog post. Much of the discussion about the iPad is still focusing on a feature by feature comparison to a netbook or a laptop. The discussion can not get out of the 20 year old world of keyboards, mice, and the windows and desktop metaphors. To properly think about what the iPad can do, you need to drop all of this context and think about things in new ways. In my previous post on the iPad, I emphasized this point, stating that the iPad is really about taking a new form of interaction (touch, with completely customizable interface) and putting it on a new form factor. In answering the eBizQ question, I realized that it goes beyond that. The key second factor is context awareness. [Gartner] estimates that sometime in the 2010’s, we will enter the “Era of Context” where important factors are presence, mobility, web 2.0 concepts, and social computing. In that same post, I went on to state that this notion of context awareness will create a need for very lightweight, specific-purpose user interfaces. While at the time, I was leaning toward the use of Dashboard widgets or Vista sidebar items, but guess what has taken over that category? iPhone and iPod Touch apps. Now, we have the potential for a device with a larger form factor that can present a touch-based interface, completely tailored to the task at hand. This is another reason why I don’t see multi-tasking as a big deal. The target for this audience isn’t multi-tasking, it’s for these efficient, single-purpose interfaces. Imagine going into a conference room where your iPad is able to determine your meeting room through sensors in the building, where it knows what meeting you’re in and who else is in the room through calendar integration, it knows the subject of the meeting, and can now present you with a purpose-driven interface for that particular meeting. Our use of information can be made much more efficient. How many times have you been in a meeting only to wind up wasting time navigating around through your files, email, the company portal, etc. trying to find the right information. What if you had an app that organized it all and through context awareness, presented what you needed? The same certainly holds true for other activities in the enterprise beyond meetings. As we have more use of BPM and Workflow technologies, it is certainly possible that context awareness through location, time, presence of others, and more can allow more appropriate and efficient interfaces for task display and execution, in addition to providing context back into the system to aid in continuous improvement. This isn’t going to happen overnight, but I am very excited to see whether Gartner’s prediction of the 2010’s being the “era of context” comes true. I think it will, and it will be great to look back from 2020 and see just how much things have changed. I couldn’t resist sharing my thoughts about the iPad along with every other technology pundit out there. I’m very intrigued by the possibilities of the iPad. From what was announced on stage, there’s nothing that immediately jumps out to say, “Wow, this is going to change world.” The reason for this, however, is because that ship already set sail with the iPhone/iPod touch. I recently read an article about Apple’s approach to user interface technology, and how the touchscreen display was really the game changer. Why be burdened by a full keyboard if you don’t need it? Instead, allow the interface to be fully customizable to the task at hand. The iPhone/iPod touch did this. The iPad is a recognition that the small form factor of the iPhone is simply not suitable for all applications. If the handheld form factor is class one, then something around the size of a sheet of paper is form factor two. Anything bigger than that starts to make more sense in a desktop setting, rather than being primarily portable. Given this angle, I think the iPad positioning makes a lot of sense. Frankly, it’s surprising we haven’t reached this point sooner. Way back in the early nineties, I took a seminar course in graduate school on human computer interaction, and four or five students had to engage in panel discussion on where interfaces would go five or ten years from then. I don’t think a single one of them expected the keyboard and mouse to still be the dominant UI technology almost twenty years later, but that is the case. It’s time to recognize that while well suited for some activities, that interface is also a boat anchor for other activities. A platform like the iPad now opens things up to more customized interfaces that may be much more efficient and intuitive for tasks. Ironically, I think it’s this same thinking that pushed Apple away from the original web-based focus of the original iPhone and into the world of custom apps. While a developer may be able to reach a wider audience with a browser based application, that’s at the sacrifice of the UI, despite AJAX, Flash, HTML 5. This is also why I don’t see Flash support as a big deal. Yes, it prevents us from watching browser based video, but I’d much rather have a specialized app with a more intuitive interface for doing so. Why be burdened by the web browser if you don’t have to? So, is the iPad revolutionary? No, I think it’s evolutionary from the iPhone/iPod touch. I’m very interested to see what applications can be developed for this form factor for the educational and medical markets. On a laptop, it’s likely that those advanced applications would have required a desk, because there’s just no way to hold the laptop, with it’s keyboard, and try to manipulate the track pad, pointer nub (whatever it’s called), or a mouse to achieve the interaction needed. With the iPad, it’s cradled in one arm, with your other hand free. You can have advanced interactions. This is where it will show its stuff. Just as the iPhone didn’t have too much to show with v1, but the partner apps became much more sophisticated with the 3G and the 3GS, the same will be true with the iPad. Two to three weeks didn’t allow partners to show much at the kickoff, but I think we’ll all look back a year from now and see some revolutionary apps that have been freed from the burden of the keyboard and mouse interface. A Gartner press release resulted in some very good posts in the blogosphere related to the future of enterprise architecture. 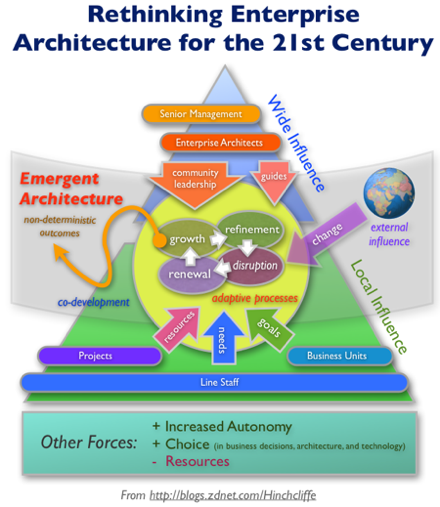 Gartner coined the term ’emergent architecture’ and encouraged companies to adopt it. For the record, I’ve decided that I really don’t like that term, and I don’t think Gartner did a very good job of defining it. They provided a list of seven differentiators from “the traditional approach to EA” but, as Mike Rollings of Burton Group pointed out in his post, most of these things are items that many practicing enterprise architects already did and knew. Do we really need a term for what many of us are already doing? While I still don’t like the use of the term emergent architecture and “non-deterministic outcomes”, the picture tries to draw a picture of the forces the come into play in producing solutions. So what is the role of EA in the future? First, the thing that doesn’t change is the role of EA in providing context. This context is an influencer on the activities that occur in the enterprise. Dion’s drawing attempts to touch on this, but goes at the scope of influence in terms of who can be influenced, rather than the information used to influence. It’s the role of the enterprise architect to bring additional context from outside of the normal scope of the effort to the solution discussion. Influence is not about centralized decision making, so as Mike Rollings called out, most EA’s have never been a centralized decision maker for all things architecture and never will be. We’re simply another party providing influence. Sometimes we have stronger methods, sometimes someone else does. In my book, SOA Governance , I emphasized policy creation first, then policy communication. If the policies are known, any decision maker can apply those policies consistently. What Dion’s diagram doesn’t capture, is the changing way in which solutions get done. He still has the “projects” box up there. There are many of us that feel this project-based culture is part of the problem. If we take a more product-based or even service-based view of our solutions, those solutions will need to be nurtured and evolve over time, rather than stood up, ignored, and then uprooted with significant effort. This notion, as others have called out, including Neil Macehiter and Neil Ward-Dutton in their book The Technology Garden and practicing enterprise architect James McGovern in his blog, is that of gardening. Do you simply let anything emerge in your garden? No. You plant specific things, remove the weeds, remove weak plants, change some things from year to year, etc. If you don’t plan the garden properly, weeds can choke the life out of other plants, or there can be conflicts within the garden itself, with one type of plant consuming higher amounts of resources, causing others to wither and die. Coming back to the role of EA as influencer though, the thing we must realize is that the dynamics around us are changing, and as a result, it may change who and how we influence. More and more things are bought rather than built. The level of consumer technology has changed the bar in terms of what individuals can do and expect. If we don’t change our ways along with it, our ability to influence will be diminished. This doesn’t mean things are now emergent. There have always been things that have been emergent, and a healthy company always has some efforts that fall into the category of throw it against the wall and see if it sticks. What’s changed is the pace at which we can do it. We need to incorporate this into the way we execute. I believe the trend toward business architecture is a clear sign of EA trying to do this. We must remember, however, that the artifacts and techniques used to provide context to developers and engineers may not work with the business. We need to speak the business language, not try to get them to understand ours. I’m an unabashed Kindle fan, but I’ve come to realize that there is room for improvement. The Kindle needs an iTunes equivalent. Not the store, but the desktop companion application. Clearly, Amazon’s original intent for it was as a book reader. For me, however, the usage parallels that of my first iPod. When the iPod came out, there was no iTunes store, but there was iTunes. You took your existing CDs, ripped them into iTunes, and put the content onto your iPod. While there’s no way to “rip” a physical book onto the Kindle, there’s still plenty of electronic content that I deal with each and every day that I’d love to have on the Kindle. Unfortunately, there’s not a good solution for that. Yes, you can email these documents to Amazon and pay a fee for wireless delivery (not cost effective for as many documents as I’d convert), or you can use a program like MobiPocket Creator or Stanza to convert them yourselves, which frankly, is a pain. What I want to be able to do is just drop a Word document or a PDF into a library in this application, and then the next time I connect my Kindle via USB, have those files converted and placed onto the device. Why would I want to do this? I receive new documents probably every single day, ranging from 2-3 pages to 20 pages or more. Keeping them on the laptop usually means they don’t get read, and printing them out is a waste of paper, and also likely that they don’t get read, as I don’t have them with me when I have time to read. Putting them on the Kindle would be a great solution for me. Plus, the Kindle allows annotations, so if I need to document something to discuss with others, it can do that for me. If this were possible, I think it would open up the Kindle for the corporate market. If there were ways to tie a Kindle to an analyst firm subscription, even better. Amazon would really need to improve the content management on the device, because one big long list quickly becomes problematic, but that can be solved through software. So, Amazon, when can we see the desktop content manager for the Kindle, or are you leaving this up to a third party to provide? Those of you that follow me on Twitter know that my Kindle 1 recently suffered an untimely demise. I had the option of purchasing a refurbished Kindle 1, or getting the new Kindle 2, and I opted for the latter. I thought I’d highlight some of the differences that I’ve noticed for those of you that are considering upgrading and giving your Kindle 1 to another family member or friend. Ergonomics. Like many Kindle 1 owners, I frequently would pick the device up and hit the next page button, or have it in its case and open it up to find that I had pressed the menu button a few times. That same feature, however, was a plus when I was actually using it. You can hit those buttons just about anywhere and they will respond. In addition to those buttons, the power switch and wireless switch on the back of the device were simply inconvenient. Outside of the buttons, the device had a bit of a flimsy feel to it. While I never had any problems with it, durable would not be the word that would come to your mind. At the same time, the actual shape of the device and its weight was very book-like, which was appealing. The Kindle 2 is very different. It is much thinner and feels much sturdier. At the same time, there’s a lot more “whitespace” around the screen, which is essentially wasted space. I would have preferred to add thickness rather than width. There’s no problems with accidentally hitting the next page buttons, and the power switch was moved to the top of the device, making it accessible when the device is in its case. The wireless switch was removed entirely and must now be controlled through a menu (I preferred having the physical switch). On the downside, the buttons aren’t as easy to press as on Kindle 1. I was accustomed to hitting the outside edge of the button, which works very well when on an elliptical trainer in the gym, and that won’t work with Kindle 2. You have to press the face of the button. Second, the changes in shape do make the device less book-like, especially when it’s not in its case. With the case on (the Amazon one, which must now be purchased separately), it was less of an issue. Finally, while it is an extra purchase, the latching mechanism for hooking it into the new case is much better. I have not had any issues with it falling out of the case. Usability/Performance. I really didn’t have any issues with the performance of my Kindle 1. Yes, there’s the flash associated with page turns, but that’s an artifact on any e-reader that uses the eInk technology. Some people felt that there would be too much page flipping, but it didn’t bother me at all. The Kindle 2 performance is noticeably faster, but as I often tell people when discussing performance, the Kindle 1 was already good enough, so this wasn’t a big deal. The second improvement on the Kindle 2 is better grayscale support. If you’re using the Kindle to read technical documents, which I do, then I think this is something that you might find important. The Kindle 1 could only do 4 shades of gray, the Kindle 2 can do 16, and this does make a different. For reading fiction, this is less of an issue. Finally, the Kindle 1 had a mirrored scrollbar that ran parallel to the vertical axis of the screen. You used a scroll-wheel to position it, and clicked it to select. The Kindle 2 replaced the scroll-wheel with a joystick, and did away with the mirrored scrollbar. I assume it’s because the performance of the screen improved, so they felt the scrollbar wasn’t needed. Personally, I liked the scrollbar better. Again, it’s not a huge deal though. Overall, the Kindle 2 verified my initial thoughts from the original announcement. It’s definitely an incremental improvement, but I don’t think the feature set associated with it is compelling enough for someone to ditch/sell their Kindle 1. There are still some things to work out, such as getting the ergonomics around those page buttons a bit better so they’re still very convenient, but not easily clicked by mistake. If you’re considering a Kindle 2 as your first e-reader, I absolutely recommend it. I love the reading experience on it, I love being able to manage my documents via Amazon, I like that it syncs up where you are within a book if you also have the iPhone Kindle app, and the convenience of the wireless modem for purchasing new content whenever and wherever (if you’re in the US) is great. A break from the enterprise IT posts with this one. Since I did quite a bit of googling on it prior to Christmas without great results, I wanted to make sure I posted an entry about my new car stereo, the Pioneer DEH-P4000UB. It comes with a USB port (accessible via a cable that’s threaded into your glove compartment), and is iPod-compatible. Even better, it’s also iPhone 3G compatible, although your iPhone will initially report that the connected device may not supported and will ask you if you want to go into airplane mode. Answer no. From there, you can now play and charge your iPhone 3G through the car stereo with far better quality than an FM transmitter or a cassette adapter. You can control playback either through the stereo controls, the remote control for the car stereo, or the iPhone. I’ve been very, very pleased with the unit. My only complaint is that the “universal controller” knob on the stereo is very non-intuitive, so you’ll need to read the owner’s manual to figure out how to preset radio stations, etc. I found the iPod/iPhone integration to be easier to navigate when using the remote control than using the universal controller, but I tend to just use the iPhone’s controls to choose a podcast. So, if you’re out there looking for a new head unit for your car and want to be able to charge your iPhone from it, and playback your music or podcasts, take a look at the Pioneer DEH-P4000UB. There’s a video review on Crutchfield, and you can buy it at Best Buy or Amazon.com . This head unit does not include bluetooth capabilities, but I’m pretty sure that Pioneer sells a bluetooth add-on for it. I can’t comment on that, since I didn’t get it. Hopefully, however, this review will help others that are looking for a car stereo that will work natively with the iPhone 3G as I was. Here’s an idea for some entrepreneur to go and run with, or even better, for someone to read and go, “That’s already been done! Go visit -blank-.” I was thinking about banking, budgets, and money management and was thinking just how inconvenient it is to move money around between various accounts. I’ve been a Quicken user for over a decade now, and it’s frustrating that there are still financial institutions that don’t download into Quicken easily. The second thing that occurred to me is that it still seems to difficult to move money around between different accounts. The average person can have a checking account, a saving account, a retirement account, an investment account (which may also require having accounts with each company that manages a mutual fund in that account), plus accounts for their family, credit cards, etc. I thought back to when I was growing up and remember my Mom having a collection of envelopes at her desk, each of them containing the cash for the month for a particular category. This was how she created her budget. I also found out later about some of the other tricks my parents used for handling things like Christmas and vacations. They had additional bank accounts that were reserved for these expenses that were going to be larger and thus required a longer time period of savings. They’d rather get interest on it from a bank somewhere than keep it in an envelope on the desk. Then it clicked. Why can’t a financial institution today provide an electronic equivalent of the envelopes my Mom used years ago? All the pieces should be there. We leverage electronic fund transfers every day, there’s absolutely no reason that this can’t be made more consumer friendly so that performing a transfer from my checking account into a custodial investment account for my kids is as simple as doing a “Transfer Funds” operation in Quicken. Does anyone make this easy today? I know there’s lots of room for improvement with my financial institution. What about budgets? If you pay cash for everything, you may as well stick with the envelopes. If you pay with credit card, once again, the technology is there. I just entered an expense report at work and the system has visibility into expenses charged to my corporate card. It was able to pre-populate the category of the expense by looking at who the payee was. Take this a step further, and it would be great if I could place controls over the charges (this would be very good for debit cards) so that I wouldn’t be warned (or even stopped) that I was going to blow the budget with a particular purchase. This would be great for kids, as well, where a parent could give them a limited access debit card that could only spend up to a budgeted amount and only for certain categories of expenses. What about those long term items like vacations and saving for Christmas presents? Why on earth should I need to open up another account to do this? Can’t the bank allow me to create a “virtual” account where money can be transferred in and out, but checks and debit card transactions couldn’t go against it? It’s certainly true that one can probably execute sound financial management with today’s tools, but it just seems to me that it can be made much easier, and if it’s easier, maybe more people will have better luck with it. So, what do you think? I’m of the opinion that someone out there has to be doing this already, it seems too obvious for someone not to be jumping all over it. If someone has, please comment or send me mail. Maybe one of the new Internet banks is doing this today. If not, well, make you thank me for the idea and give me a free toaster or something when I open my account. Dr. Lippman came and talked to us about MIT Media Lab in a keynote this morning. He was an excellent speaker. Most of the talk was focused on how technology can contribute to the increasingly social nature of our society. While we increasingly have more and more personal technology, the usefulness of that technology will largely depend on its ability to focus on the “we” rather than on “me.” A great point that he made is that a company’s value is in its social network- the speed with which the values and ideas flow through the company. Again, the degree to which technology supports that is a key element. Excellent talk. The more I thought about this, the more I agree with Peter. If your company has individuals as either direct or indirect customers, I’m sure that the marketing department has segmented them into different groups each with their own strategy for how they will be marketed. I don’t know of any enterprise of significant size in the U.S. that doesn’t have an internet presence, and I’m willing to bet that nearly all of their marketing departments see their web sites as more than just a place to get electronic versions of paper documentation or marketing materials. In other words, the web site has gone through three phases. The Information Web: In this phase, everything revolved around pushing information out to the visitor. The Transaction Web: In this phase, the communication is bi-directional, predominantly focused on information from the enterprise, and business (i.e. money) coming from the visitor. The Participatory Web: Here, the emphasis shifts from the individual to the community. It’s not just the enterprise pushing information out, it’s the full ecosystem all of the site visitors and all of the enterprise’s partners. The big challenge with this third phase comes down to community. When an enterprise tries to own the community, it will probably work very well for established customers, but it may have a hard time bringing in new members. In contrast, a site focused on enabling communities of all sorts, like Facebook or MySpace, is better positioned for community growth. If this is the case, why wouldn’t an enterprise try to involve these sites in their marketing strategies as a growth tool. The point would not be to own the community, but to attract new members to its community. This is no different than the physical world where a company establishes a branch office or a retail location in a community. It has to compete with others, but at the same time, if it is perceived as valuable and meeting the needs of the community, it will survive and thrive. The time is ripe is to think about how your company can build applications and content for these sites to attract new interest. I’m listening to Jon Udell’s latest innovator conversation, this time with Valdis Krebs, courtesy of IT Conversations. Valdis is a researcher in the area of social networks and he and Jon are discussing sites like Facebook, LinkedIn, Plaxo, MySpace, etc. One of the interesting points that Valdis makes is that social networking has always been a peer-to-peer process. Two people engage in some form of personal, direct communication to form a “connection.” This is predominant form of building a network, rather than joining a club. The model of virtually all the social networking sites is one of “joining”. The discussion brought me back to the late 90’s when I had purchased a PalmPilot. I actually owned one that had the U.S. Robotics logo on it versus the 3Com or Palm logos that came later. One of the features that came along later (I think it was when I upgraded to a Handspring device) was the ability to “beam” contact information to other Palm owners. The goal was to do away with business cards and instead “beam” information electronically. While I thought the technology was pretty cool, it didn’t survive because the PDA didn’t survive. It all got morphed into mobile device technology, and with the multitude of devices out there now, the ability to quickly share information between two devices disappeared. I think this would be a great technology to bring back. I attended a conference back in December, and of course walked away with a number of business cards. I then had to take the time to put those contacts into my address book. Thankfully, as an iPhone owner, I only had to put them in one place for my personal devices, but I also had to enter them into my contacts on my work PC. Then became the step of adding all of these people to my networks on LinkedIn (at a minimum). I actually didn’t do this, most of the people actually had already sent me requests for the various social networks. In thinking about this, I have to admit that this was way too difficult. What we need is the ability to share contact information electronically with our handheld devices via some short range networking technology like Bluetooth, and have that electronic information be “social network aware” so that as a result of the exchange, contacts are automatically added to friends/contact lists on all social networks that the two parties in common. It should be an automatic add, rather than a trigger of email to each party of “do you want to add this person to your network?” An option would be to ask that question on the device at the time of the interchange, which would allow people to be added to appropriate networks as is supported by sites like Plaxo Pulse. So, for all of you involved with social networking technology, here’s your idea to go run with and make it happen. I’ll be a happy consumer when it becomes a reality. A combination of things, including the Workday acquisition of CapeClear and doing my taxes, got me thinking a bit more deeply about integration as a service (IaaS). When I have my large enterprise hat on, I’ll admit that IaaS doesn’t excite me very much. The main reason for this starts with what I envision when I see this, however. What I picture is taking all of the mapping exercises, transformations, etc. that are done today using some visual tool from an EAI vendor and moving it to a web-based system. I still need to do all of the work to wire things up, but the actual processing behind all of this goes on outside the firewall. This certainly doesn’t make sense if all of my integration points exist within the firewall, and I’d even go further to say that it’s not very attractive when only one of the integration points is outside of the firewall. Why? Well, there are already providers out there that will not only handle the processing, but also do the mapping. Essentially, I give them information on how I want my data, and they take care of doing all the dirty work to map to the other integration point. So, from this perspective, my definition of IaaS actually winds up having me do more work than the traditional “integration as a service” providers. If all of my integration points are outside of the firewall, things get a bit more interesting. This occurred to me when I was doing my taxes. Most of the leading tax software providers have both desktop versions and online versions. In the case of the online version, the data resides in the cloud. The data behind the tax return must integrate with data from other cloud providers, such as payroll systems and financial services companies. While this integration works well, the same situation isn’t as good for general personal financial planning software. Take Quicken for example. In the desktop version, some of my financial data can’t be automatically imported into Quicken, because the financial provider hasn’t exposed the information according to the necessary standards. Interestingly, however, when I looked into the recently announced Quicken Online, some of the financial providers that didn’t work in the desktop version were able to be integrated into the online version. I suspect that there may be some screen scraping going on, as is the case for many financial aggregators like Yahoo Finance. Anyway, the short point to that long winded paragraph is that when all of the data exists in the cloud, there’s no doubt that the need to integrate that data for one purpose or another will soon follow. The key question then, however, is whether services should be provided to allow individuals to create their own integration paths, or if the service providers will be expected to simply integrate with other leading offerings, much in the same way we expect the software we install inside our firewalls or inside our homes to integrate. I suspect it will be the latter. Whether its the consumer market or the enterprise market, I think we all want the difficult integration problems to be handled for us. The vendors that are able to do so, will be successful.